I've had the Huawei Watch GT for a few days now and It's great. It's my first smart watch and I've been holding off getting one for so long until recently. I've checked the FAQ and was not able to find a topic on this already but, will the Huawei Watch GT ever be able to allow replying to texts/whatsapps in a future update? Being able to view texts is great, but I'd love the ability to be able to reply on the go! Besides the double notification bug (which has already been addressed) I'm really pleased with it! I've yet to try out the sleep monitoring. Oh wow, I have just figured out how to add third party app notifications. This watch had become A LOT more useful! Could you kindly please share a few more information on how was that achieved? Software update? 3rd party app? Health app settings? You can add these from the Health App. Go into the Watch GT settings, then notifications and you will see a list of apps you can toggle on/ off (see below). Oh! thanks a million for the prompt reply. I am holding of from many updates as I am kind afraid in case something goes bad, due to my "fear" of updating.. I can see on some youtubers that the icon(s) of the app(s) appear as well, while on others don't.. Can you show an example pic of a notification, from any 3rd party app? Hi @iMohMoh there is not currently any talk of replies being integrated through future updates, however if you PM @Max your feedback for this feature. Then it's something that the Devs might consider in the future. In know it's a while ago now, but how did you get WhatsApp notification on your watch? Mine only does text messages and calls, nothing else. Whatsapp notifications (among others) work fine for me. If you'd like to go through settings and compare I'm happy to help. I have been searching for something, that´s important for me, and can´t find an answer. 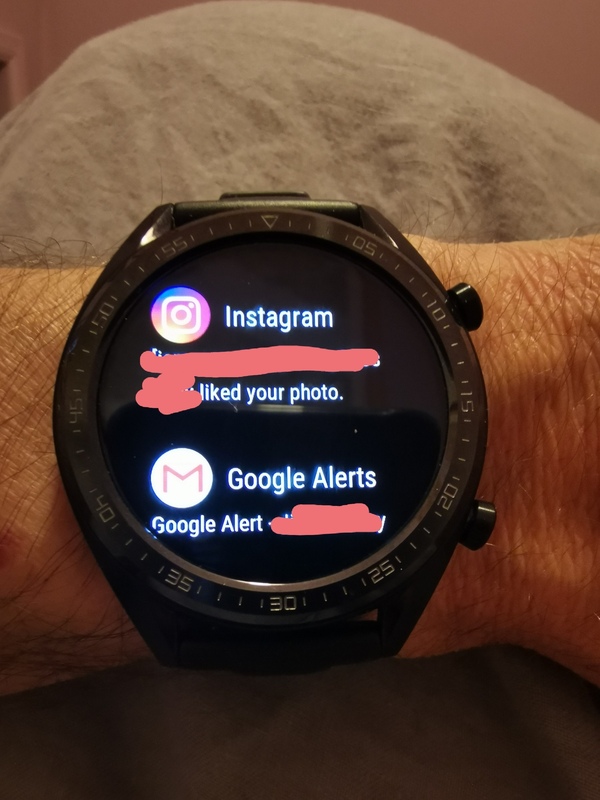 I have a smartwatch with wear os, working with a iPhone, and when i read and/or dismiss a notification (no mater the app, whatsapp, messages, facebook, e-mail...) the phone recognize it and the bubble in the lock screen of the phone, with that same notification, is also dismissed.Does this also happens with the watch GT? I like it this away because I don´t have to do the same on the watch and on the phone, and also because when I receive a notification the phone rings once, and if I read it on the watch the phone wont ring a second time for the same notification. Hi @Mike335i can you please tell me how did you do it to get the whatsapp messages on the watch Gt?? Hey, do you know if this the same when using the watch with the new iphone? The app is all up to date and so is the watch yet I am not getting these. Just getting the option to turn messages on and off. Hmm, that's odd. I use a Mate 20 Pro myself but assumed the IOS app was the same. Do you have the notifications option when you go into the Watch GT section of the app when the phone is connected? I just downloaded the Health app onto my iPad and paired my Watch GT. I get exactly the same as you. I don't know what this amounts to in terms of notifications though. Do you only get messages? Sorry I'm not much help with this one. Perhaps another iPhone user on here will be able to offer some advice?